Sickness that affects breathing crops up often during childhood. Naturally, you want to watch out for any sign that your youngster is coming down with something. How fast they breathe can be a signal. If it's a bit too quick, that can be one of the first symptoms of a lung infection, especially for a baby or small child. Children younger than 3 need extra-close attention because this type of illness can be especially hard on them. First, you need to know what counts as typical, healthy breathing. To measure how fast your child is breathing, count how many times his chest rises in 1 full minute. If he’s outside the normal range for his age, something may be wrong. He's less than 1 year old and takes more than 60 breaths a minute. He's 1 to 5 years old and takes more than 30 breaths per minute. If your child is older than that, call the doctor if he gets winded more than usual after exercise, or even ordinary activities. If his quick breathing keeps coming back, that’s another reason to check with your doctor. It usually comes on during the winter or early spring, and the first symptoms look like a cold. Then, RSV spreads into the lungs, where it can lead to things like bronchiolitis and pneumonia. Asthma: Kids who have this usually show the first signs of it by the time they’re 5 years old. Besides fast breathing, symptoms can include coughing or wheezing. Pneumonia: This may come after your child has a cold or flu. It can be from a virus or bacteria. Kids who are 2 or younger are more vulnerable. They should go to a doctor if they show symptoms. 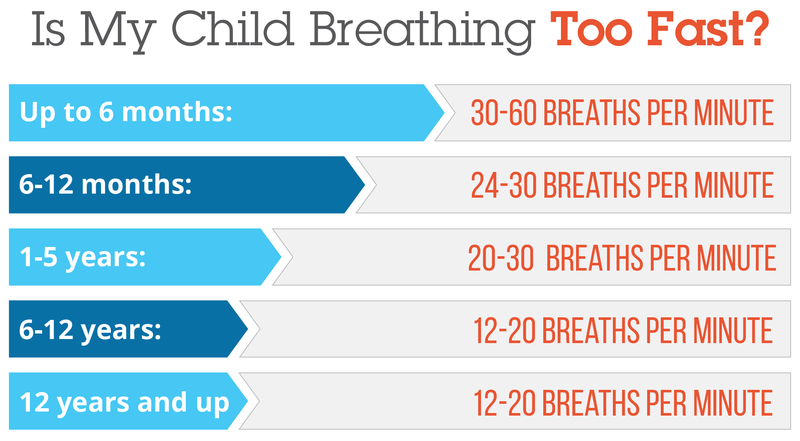 It's normal for a child to stop breathing for 5 or 10 seconds, then pick back up again on his own. But if it goes longer than 10 seconds or he starts to turn blue, call 911. If your child’s breathing pauses while he’s asleep, that might be a sign of sleep apnea. This can crop up in kids between 2 and 8 and years old. There usually are other symptoms, too, such as snoring. Breathing issues are common in kids, especially if they go to day care or have brothers and sisters. It’s normal for them to get as many as 12 infections a year. Each one may take a couple of weeks to clear up. Different conditions have similar symptoms, so it may be hard for you to figure out which one your child has. That’s where the doctor will help. Cleveland Clinic: “Asthma in Children,” “Newborn Behavior,” “Childhood Respiratory Infections and Other Illnesses,” “Bronchiolitis,” "Croup." Merck Manual: "Overview of viral respiratory tract infections in children." New York State Department of Health: "Pediatric respiratory rates." University of Wisconsin: "Vital Signs in Children," "Counting Respiration Rate."